When you look at the Slate 21, and you look at the tech specs, it's hard to avoid the thought about the small specs of the machine when it comes to RAM and Storage: 1GB of RAM, 8GB of Storage.. what the engineers were thinking?? Nevertheless, I'm a proud owner of such a slate, and I want to share with you some tips that could help you with the Slate 21. Some of those tips will require root privileges. 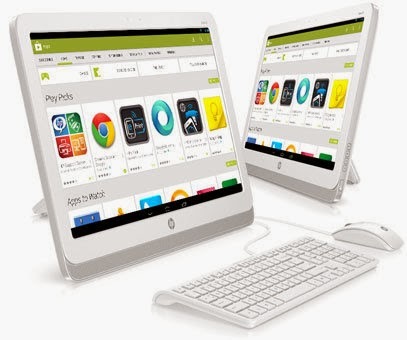 Please note: So far, it seems that HP is doing their best to block any rooting attempts. Their latest update includes security patches from Android 4.3 and 4.4 which prevents all known rooting methods from working (and I tried all of them so far). However, when it comes to a chase between HP and Android "hackers" - those "hackers" will win (there's not a single Android device that hasn't been rooted so far, other then this Slate). Remember - if you root it (or unlock it), your warranty is lost. Do you plan to do some serious typing and you're a fast typist? switch keyboards from the bundled one to a more professional one (Logitech and Microsoft got some serious keyboards). As a person who types 80+ WPM (Words Per Minute), I find the bundled keyboard useless for my needs. Want to use another keyboard and you're missing the Android shortcuts? you'll need a new app for that. You can try "external keyboard" (which is free), and if that doesn't suit you, try the External Keyboard Helper Pro (which costs around $3) - the latter will give you tons of options to configure any key to any Android action, it also let you select which keys to use to switch Layout and other nice features. root The Tegra 4 in the Slate 21 is clocked at 1.66 GHz, which is really slow (compare that to the Asus TF701 which is also a Tegra 4 based device and it's clocked at 1.9 GHz). There are some "mods" which envolve kernel modifications and recompile to achieve a serious speed boost (the nVidia Shield users/hackers at XDA reached 2.55 GHz! ), but be careful with that! The nVidia shield got a fan, the Slate-21 doesn't, so you could easily fry your Tegra 4 (although you'll probably won't fry it, you'll get a very unstable machine). root 8GB Space is really, really a small place when you're installing games, downloading videos etc. Although it's not possible to completely move apps to any external storage to SD, you can move the apps+data with some apps that will do it for you. Check this video how it can be done (although this video is talking about Galaxy S4, it's the same app and same method with Slate 21). This will give you the space that you need so much. Before doing that, remember to get a Class 10 SD Card (and don't format it as exFAT or NTFS, the Slate's kernel doesn't support those file systems fully, only FAT32). USB ports are different! Don't ask me why, but it seems that the USB ports in the Slate 21 are working differently compared to other devices. Examples: if you plug a keyboard or a mouse to the USB port on the left, it won't recognize it, so if you're plugging any USB device and you don't see it being recognized, try to connect it to the ports behind the slate. (update: thanks to "COWA" from the HP support forum, this behavior happens when you enable USB debugging. Disable USB debugging and the side port should work as the other 2). root Hackers - Be careful with the Slate's boot loader! since HP rewrote the boot loader, you can easily damage the boot loader if you install wrong 3rd party recovery image (currently there aren't any, neither CWM or TWRP for the Slate 21). If you'll damage the boot loader, you'll be stuck in whats called "APX mode", which is a low level and it's being used to flash firmware to the nvflash. This is very tricky if you don't know what you're doing and could easily leave you in a hard-brick situation! 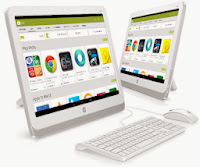 HP started selling few months ago the HP Slate 21, an Android based AIO (All In One) device which is a 21" IPS monitor which got an Android 4.2.2 inside. The Slate 21 device is quite good, although it's really low on specs. Only 1GB of RAM and only 8GB Space inside (although you can stick a full size SD card inside). You can read some reviews about the device here, here and few people wrote about it on Amazon and you can read their reviews here. Technically, this machines IMHO begs to be modified. You don't have the issues of tablet heat, so you might want to overclock it, and maybe do some other software modifications.. In order to modify anything on it (that means: changing firmware, recovery, boot loader etc) you'll need to unlock it first, and here are the instructions how to unlock it. After unlocking it you'll need to root the Slate, and so far I failed to find a way to root it (I tried several methods, including the nVidia Shield way and the TN7 way - it doesn't work), but if you want to try it, go ahead and if you manage to root it, I'll be happy to hear about it and publish it here (with credits to you). Warning: The following steps WILL VOID YOUR WARRANTY! I'm not taking responsibility if your device will brick, explode or anything else, you've been warned! In order to actually get access to the machine, you'll need a Male to Male USB Cable, like this one, which you can order from that page or simply buy from your local tech store such a cable. Connect it from the Slate's side USB port to your PC. Your Windows (or Mac or Linux) will recognize the device as MTP. Make sure you have the latest updates for your Slate. Unlocking the device will not let you receive automatic updates, so click on the Settings, scroll to the bottom, click on the "About tablet" and then click on System updates, and then click on the "Check Now". If your device has updates, you'll see it there. Now we'll un-hide the Developer options. Click on the "About tablet", and then click 7 times on the "Build Number", and after clicking 7 times, you'll see on the left side "Developer options" - click on it, and click on the "USB Debugging". In my Slate, the device rebooting after clicking on it, so if it's rebooting on your slate, let it reboot. Install ADB and fastboot On your Windows machine (instructions are here) and after installing ADB and fastboot, connect your Slate to your Windows/Mac/Linux. In Windows, you'll see a new device, and ADB device. If you get an "unknown device", or don't get anything, then follow the instructions here. Open a command line prompt and run the adb devices command. It should show you your slate as a number with the word "device". If not, check the instructions on the link above and make sure you don't have "unknown device" - or else ADB won't know how to talk to your device. This will reboot your slate and will give you a simple menu. don't select anything. This will show you a simple menu to select if you want to keep it locked or unlock the device. Use the Volume buttons to choose your option (select: unlock) and then press brightness up key (the button below the volume keys). Congratulations, your device is unlocked. If you want to re-lock it (and again, this will erase everything on your device! ), follow the steps above and select "lock". I don't know if the slate "phones home" to report if it's locked or not, so I don't know if you warranty will be restored (probably not). The next steps which are still unknown are rooting the slate, and installing a new recovery. While finding a way to permanently root the slate will be a matter of short time, recovery is another thing and requires to create a new image with modifications for the slate.